I came across your site by chance and was surprised to find a file with my father LTJG Wayne E. Bancroft making an appearance at the 6.26 mark on the file. The vintage cellulose 8mm/16mm films entitled “Navy Martin PBM-5 ‘Mariner’ VP-48”. My father died in the Koran War in December of 1952 and I was born in April of 1953. When that aircraft went down there were 14 men aboard her. Only 4 survived and today only 1 survives. This Saturday February 21 2015 the son of LTJG Wayne E. Bancroft and I are meeting outside of Fresno Ca. with the last surviving member of that crew. This filmed interview along with my original video and photographs and documents from the Bancroft family will be used to create a production documenting the story surrounding that crash. Last edit: 4 years 1 month ago by ImageMaster. February 16 2013 I digitized a 16mm film containing clips of Martin Mariner PBM-5 taken in the early 1950's at NAS Kaneohe Bay in Hawaii. The film clip runs 7 minutes and 10 seconds. At 5 minutes and 38 seconds into the film one of the Navel Officers turns and smiles at the camera. October 20 2014 Wayne Bancroft is at home in Illinoi surfing YouTube for some visual instruction concerning a project he is involved in. On the right hand side of the screen are some suggested videos and Wayne chooses to view one of these videos. It is about a B-4 Bomber. After that another shows up that catches his eye. This one concerns a Martin Mariner PBM-5. It is the film that I digitized in Feb of 2013. Wayne has never seen his father move. He has only seen black and white photographs of his father as the crash that took LTJG Bancroft's life occurred 4 months before Wayne Bancroft Jr. was born but he is very, very familiar with his fathers image and immediately recognizes the smiling young sailor in whites as his father. Wayne is seeing for the first time in his life a color moving image of a man only known to him by black and white photos and stories told by his mother. Much research by Wayne and I have turned up many things but none more interesting than Joseph O. Smith. Smith is the last living crewmember of the ill fated flight in 1952. He is also the last living person to have seen his father alive. On February 21 2015 I met with Wayne Bancroft, (son of LTJG Bancroft) from Illinoi and Joseph Smith who is the only living survivor of the Martin Mariner PBM crash in Dec. 1952. A 6 hour video interview of Wayne Bancroft and his son Luke with both Joseph Smith and wife Beverly was conducted. This material as well as period film, photographs and documents will be used to produce a video about the crash that occurred in 1952 and the crew of Patrol Squadron 47 PBM-5 BNUR 84787 as well as their families. I have a story I felt compelled to write. It’s about a journey that I secretly dreamed of from the time I was a little boy. It’s about my relationship with my father, a man whom I never met. He died in a plane crash on December 26, 1952, during the Korean War. I was born in April of 1953. Although I never met him, I am my father’s son, and he has influenced the person I am today. I hope you feel compelled to read my story. While researching the crash, I received an email from a retired Navy officer with the salutation “Sorry for your loss.” I had heard these words many times before. On this particular occasion, I felt the need to reply with more than a simple “Thank you.” My reply reflects my personal feelings. At the same time, I am not alone in that many others have lost a loved one to war. I miss my father dearly even though I know he has always been with me. I felt his presence as a little boy and again most recently. I missed not having him to take me fishing or to play ball. I never felt sorry for myself. What good would that be? As young men we dream big. Barbara Hedrick, Rhumell Harrell and Sue Atkins are the sisters of Rufus Lloyd (Bud) Mounce a crewman on the plane. They obtained information about the plane crash and wanted to share this information with the other families who were unknown to them at the time. They enlisted the help from Navy officer M. G. Gallant, Navy Missing Persons Section. In 1999, I received a letter from, Barbara Hedrick. The letter was delivered through the Department of the Navy, Navy Missing Persons Section and was addressed “Dear Family Members.” Enclosed with the letter were documents detailing the chilling events of that day. I knew little of my father’s death prior to receiving this letter. I remember the sorrow I felt while reading the documents, the sorrow of not having him there to love and teach me. It opened up a hole in me that had been sealed over. I fought the emotions calling for me to breakout in tears. I placed a copy in my desk drawer at work and occasionally brought it out. I secretly wanted someone to ask what I was reading as I couldn’t bring up the subject myself. In actuality, I brought it out only when others weren’t looking. I didn’t give them much of a chance to notice and ask. My mother gave me my father’s briefcase 20 plus years ago. I opened it for the first time a little over five years ago. At about the same time, I placed a photo of his plane on my desk. I was starting to be able to tell others my story. Shortly after, I was helping develop a product for market. (I am not going to name it as I don’t want to commercialize it here). I contracted a graphic artist over the web to help. When I got the bill, I realized he lived in the house my father was living in when dating my mother. Next came the video that launched this project. On October 20, 2014, I was surfing YouTube on an unrelated topic. My focus was redirected by one of the ‘suggested videos.’ On the next list, was the video “Navy Martin PBM-5 ‘Mariner’ VP-48.” Out of curiosity I watched it, never expecting to see my father. I looked for him in the past and found nothing. When he appeared at the 5:38 minute mark on the film, I instantly recognized him. I didn’t need any confirmation, but I wanted confirmation. My two sons did not hesitate to validate my findings. This was a moment of excitement and discovery. I was totally unaware of the importance of this discovery. He is on the video for two seconds. Prior to seeing the video, I only saw him in still black and white photos. It was like meeting him in person for the first time in my life. He was wearing his crisp white officer’s uniform. You first see his profile, and then he turns to the camera, and he smiles. It felt as if he could have been smiling at me. My father LTJG Wayne E. Bancroft enlisted in the Navy on October 18, 1943. The PBM had two engines, one on each wing. Each engine was equipped with an electric generator used to operate the fuel pumps. The bomb bay doors and air flaps were electronically controlled. They took off from Iwakuni, Japan with the weight of the airplane above single engine capacity. Approximately three hours into the flight, the plane experienced left engine failure at an altitude of about 1,100 feet. To lighten the load, the pilot ordered the depth charges be jettisoned along with the fuel. A short time later the electric generator of the right wing failed. Without the electric generators, the bomb bay doors and the fuel pump became inoperable. Radio communication was garbled. The bomb bay doors could not be closed, and the fuel could not be jettisoned. The open bomb bay doors greatly increased air drag, and the plane rapidly lost altitude, struck the water, and bounced. Next the airplane hit a large wave, causing the nose of the airplane to dip below water and explode. The plane rapidly sunk and fuel was spread over the surface of the water. This created a large fire on the surface of the water. Two surface ships of Task Force 77, guided by the fire, sped to the area to conduct rescue operations. The USS Renshaw was the first ship to arrive and was later joined by the USS Erben. During the rescue operations, the Renshaw lowered a lifeboat in waters with 15-foot waves. The men of the Renshaw managed to heroically rescue four members of the crew. There were fourteen crewmen on board the plane and ten perished (including my father.). 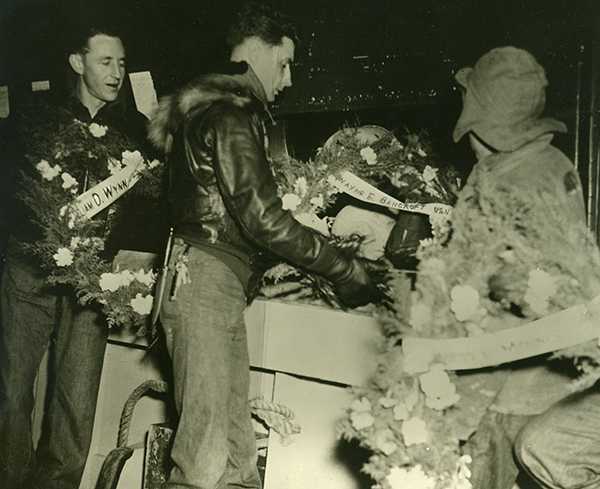 The survivors were taken to the naval base at Yokosuka, Japan. Two of the men were hospitalized for treatment and the other two men returned to duty. On December 20, 1952, a United States Air Force transport aircraft was enroot from Larson Air Force Base in Grant, Washington, to Kelly Air Force Base near San Antonio when on takeoff, the plane made a sharp left turn, the wing clipped the ground and crashed killing 87 troops. Edna Mounce wrote to her son Bud a crewman of VP47. In her letter, she writes she felt sad for the boys and was relieved that he wasn’t on the plane. The letter was returned to Edna Mounce unopened. On the night of the crash, Beverly Smith had a dream that Joseph Smith (her husband) was thrashing in the water. She told her co-workers and they tried to comfort her by saying it was probably nothing. For three nights prior to the crash, my mother had a reoccurring dream, in which my father was running away from her. All the while, he was looking back at her. The day I saw my father on YouTube was the day I began a journey of self-discovery. I made friends and benefited from their wisdom. I realize that many others identify with the elements in this story and that our love ones are still with us in a spiritual way. I spent many hours constructing this labor of love so that it captures my true feelings. It has been a journey filled with happiness and sorrow. This journey has just begun. I tried to make it more about the crew of VP47 and less about me. No matter how hard I tried, the story line was like a boomerang. It just kept coming back in my direction. After I got my first thoughts on paper the story line began to emerge. I labored over my choice of words to insure they reflect my thoughts and feelings. I never did write much about the crew of VP47. I still think it’s important to tell their stories. The problem is that I know very little about the other cure members. I guess I need to learn more about them. I am grateful to the following individuals. Barbara Hedrick, Rhumell Harrell and Sue Atkins are the sisters of Rufus Lloyd (Bud) Mounce a crew member aboard the plane. Bud’s sisters got this chain of events started in 1999 when they wrote to the families of the other crew members. Joseph and Beverly Smith. Joseph is the only living survivor. They warmly welcomed us to their home, shared their knowledge and the artifacts they saved. We learned new details of the crash itself plus the amazing role the USS Renshaw played in the rescue. My mother, Olga (Peggy) Bancroft who told me stories of my father, Luke Bancroft my travel companion, Barbara Bovino my sister, and Elaine Thomopoulos, Nick Thomopoulos and Anita Valentin for their editorial help. Darryl Studer, Frank Breitenstein, Richard Zeisel, Navy officer M. G. Gallant, Navy Missing Persons Section. Last edit: 4 years 1 month ago by webancroft.